Configuring Cisco Voice Over IP, Second Edition provides network administrators with a thorough understanding of Cisco’s current voice solutions. This book is organized around the configuration of all of Cisco’s core VoIP products, including Cisco CallManager software, Cisco 7910 series of phones, and server-based IP PBXs. In addition, AVVID coverage has been added. An update to a bestselling title in a growth market. Voice Over IP is expected to make great inroads in 2002. 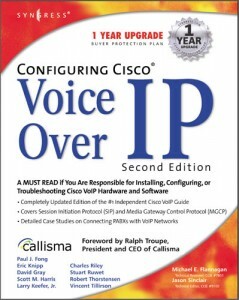 Voice-over-IP got its start at the time of the first edition of the book; it is now real and more companies are adopting it since IT managers have become less skeptical of IP telephony’s reliability and more aware of the potential cost savings and application benefits of a converged network. Voip wares now promise easier quality-of-service (QoS) deployment, and a multitude of new IP phones and conferencing stations for corporations. Cisco and IBM recently announced a package deal that could help businesses quickly roll out IP voice in a small or midsize office. Since getting into the IP telephony market two years ago, Cisco has seen quick success in selling its voice-over-IP products into its vast installed base of IP LAN equipment customers. The firm was the top vendor of IP phones in the first quarter of this year and second in IP PBX system shipments (behind 3Com), according to Cahners In-Stat.